Simon & Schuster, 9781451691597, 304pp. In a thrilling drama of man versus nature, journalist Jonathan Waldman travels from Key West, Florida, to Prudhoe Bay, Alaska, to meet the colorful and often reclusive people who are fighting our mightiest and unlikeliest enemy. He sneaks into an abandoned steelworks with a brave artist, and then he nearly gets kicked out of Ball Corporation’s Can School. Across the Arctic, he follows a massive high-tech robot that hunts for rust in the Alaska pipeline. On a Florida film set he meets the Defense Department’s rust ambassador, who reveals that the navy’s number one foe isn’t a foreign country but oxidation itself. At Home Depot’s mother ship in Atlanta, he hunts unsuccessfully for rust products with the store’s rust-products buyer—and then tracks down some snake-oil salesmen whose potions are not for sale at the Rust Store. Along the way, Waldman encounters flying pigs, Trekkies, decapitations, exploding Coke cans, rust boogers, and nerdy superheroes. The result is a fresh and often funny account of an overlooked engineering endeavor that is as compelling as it is grand, illuminating a hidden phenomenon that shapes the modern world. Rust affects everything from the design of our currency to the composition of our tap water, and it will determine the legacy we leave on this planet. 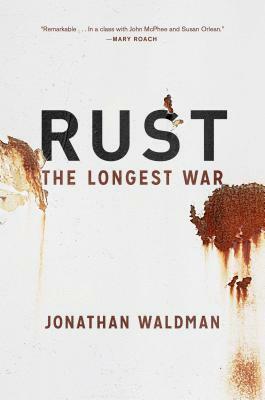 This exploration of corrosion, and the incredible lengths we go to fight it, is narrative nonfiction at its very best—a fascinating and important subject, delivered with energy and wit. A Ted Scripps Fellow in environmental journalism at the University of Colorado, Jonathan Waldman grew up in Washington, DC, studied environmental science and writing at Dartmouth, and earned a master’s degree from Boston University’s Knight Center for Science Journalism in 2003. He has spent the last decade writing creatively about science, culture, and politics for Outside, The Washington Post, McSweeney’s, and others. Rust is his first book. He lives in Colorado.